Valle de Bravo is one of Mexico's loveliest colonial towns, set on the gentle shores of scenic, but man-made Lake Avandaro. It's close enough to Mexico City to have become the weekend retreat of anyone who can afford an escape somewhere this stunning. And the hills surrounding the lake are covered in misty forests which offer those who enter a real feeling of being out in the wilderness. Our pick of the best places to stay in Valle de Bravo is a stunning remote forest lodge, where you can truly feel at one with nature. The colonial old town is just as charming as the setting though, with red roofs and an elegant main square. In fact much of the town's architecture is elegant. Take a hike up to the Cascadas Velo de Novia - a beautiful forest walk leading up to the dramatic waterfalls. There's also a restaurant with views of the falls where you can recharge after the walk. Visit the Piedra Herrada Sanctuary and enjoy the Monarch Butterflies in their natural environment. It's also possible to ride horses to the summit which makes for an easier climb than walking. Experience serene tranquility at Carmel Maranatha, a cluster of different yet lovely churches set amongst the trees and hills all contributing to the peace of the place. Marvel at the view at Mirador La pena - the hike is worth it and provides sensational views of the lake and surrounding countryside. La Gran Stupa Bon para la Paz Mundial - a wonderful monument surrounded by tranquil nature. Our pick of the best places to stay in Valle de Bravo enable visitors to experience the beautiful nature synonymous with the area, in luxurious settings. Rodavento is a remote forest lodge in a beautiful valley just outside Valle de Bravo. Accommodation is in tent suites, which might sound like a strange combination, but think luxury safari, complete with fireplaces and sumptuous furnishings. As well as the opportunity to get back to nature, while still enjoying a spa break, there's loads to do in this neck of the woods. If you'd prefer your own space this holiday, check out our online partner, Booking.com for a range of self-catering options in Valle de Bravo. Fly to Mexico City International Airport located 147km (91 miles) from Valle de Bravo. The airport is served by a wide range of domestic and International carriers. There are multiple bus services from Mexico City to Valle de Bravo. Best time to visit - if you're here in October or November you might see the annual international arts festival, the Festival de las Almas, and if you're here in December or January, you just might catch some of the annual migration of the Monarch butterflies. 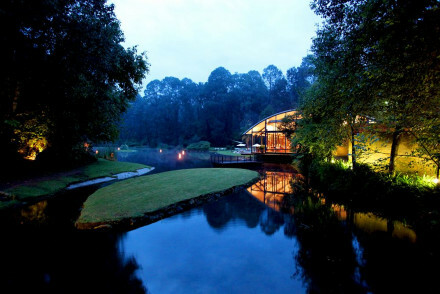 A remote forest lodge with beautiful tented suites that sprawl through the valley. A back to nature experience but with all the luxury comforts, fantastic spa, sumptuous furnishings, roaring fires. The outdoor pursuits available make this a great family experience. Suites - Tented suites in mountain-esque villas. Great walks - Surrounded by beautiful countryside, there are innumerable trails through the pine forests and along the lake. Back to Nature - This remote lakeside valley lodge will put you back in touch with nature, while catering to your every need. Kayaking - Hotel kayaks are avaialble, no better or more peaceful way to explore the local area.